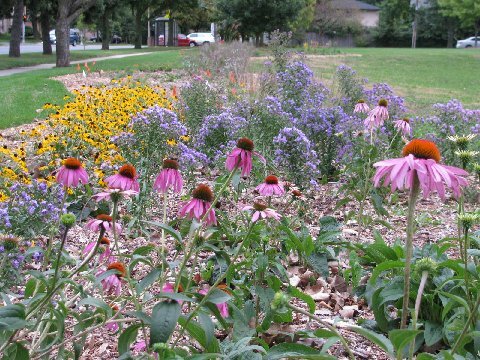 The Wilmette Park District is developing a Native Illinois Prairie garden within the detention area located at the north end of Centennial Park. Seed plantings began in the fall of 2010. The project is expected to take a few years to become established. When complete it will attract numerous birds, butterflies and other wildlife. 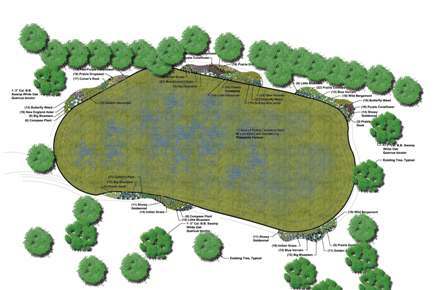 Click here to download a PDF rendering of the 2010 garden site plan which is shown above. Phase One: Native upland prairie flowers and grasses surrounding part of the detention basin were planted in June of 2010, by Wilmette Boy Scout Troop 2. In November the one acre detention basin was planted with wetland prairie seeds. (Planning and design by Charlotte Adelman and 3D Design Studio). Photo taken by Joe Bruner, Boy Scout Troop 2, in September 2010 of a portion of the upland prairie flowers and grasses planted in June 2010. Visitors observed goldfinches, native sparrows, bees and a variety of skippers and butterflies that were attracted to the upland prairie's Purple Coneflowers, Orange Coneflowers, New England Asters and Blue Vervains. Although not shown in this picture, the prairie's abundance of several colorful and fragrant species of native milkweeds attracted numerous female egg-laying monarch butterflies which produced monarch butterfly caterpillars. Phase Two: Additional native upland prarie flowers and grasses were planted by Wilmette Boy Scout Troop 2 in June 2011 to create a 15-foot wide border surrounding the entire detention basin. (Planning and design by Charlotte Adelman and Joe Bruner). Listed below are the seeds planted in the (wetland) detention basin. Listed below are the plants (native prairie grasses and flowers) planted and scheduled to be planted in the upland areas surrounding the detention basin. Zizia aurea (Golden Alexanders) - Host plant for Black Swallowtail and Anise Swallowtail butterflies. Also harvested from the site in the blue protection covers are Swamp White Oaks that will be transplanted at a future date.